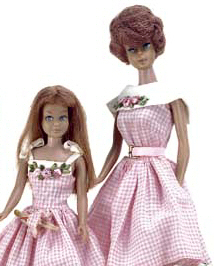 Barbie's coordinating outfit is Dancing Doll #1626 (1965) . 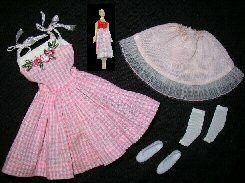 Skipper's pretty pink and white gingham checked sundress has ribbon straps that tie at the shoulder. It has a floral applique. The dress is fairly easy to find, but the miniature Barbie, her skirt and the slip to this ensemble can be very hard to find.